As we have seen recently, traditional tunes often have multiple identities. This week I abandoned my plans for the FluteFling Improvers class to teach The Blackberry Bush, a popular 4-part highland pipe reel because I wasn’t happy with the version I had prepared: it was overly complicated and too far removed from what I hear played. So instead I decided to go keep it simple and revisit the idea of Scottish single reels. A single reel is a 16 bar tune as opposed to the 32 bar ones which are frequently encountered (and never called “double reels”). The school of thought is that single reels generally tend to be the older of the two forms. The main focus of the class was The Pitnacree Ferryman, often known as The Boatman of Pitnacree. It has been recorded by many including Silly Wizard and fiddler Alisdair Fraser and is included in a number of collections, but isn’t perhaps as well known as it should be. While looking around however, I did come across this 1870 version from The Glen Collection in the National Library of Scotland. 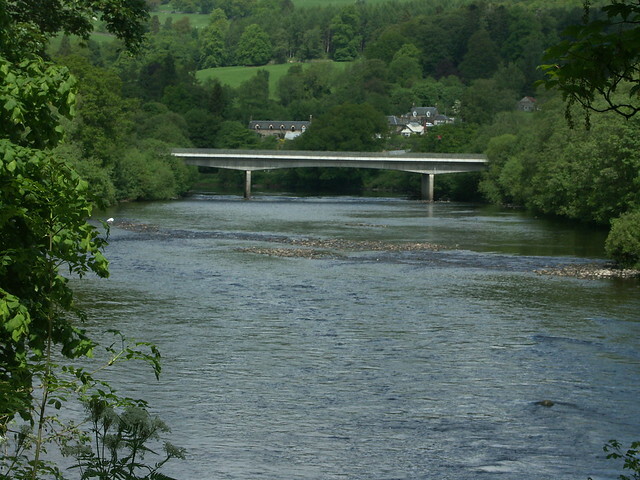 Pitnacree is in Perthshire, where the road to Aberfeldy from the modern A9 crosses the river Tay near Grantully. We can assume that the ferry operated here originally. This is Neil Gow country and I imagine that he may have helped to popularise the tune. The resources for this tune are up at The Flow and as we spent some time looking at a roll on A and some other decorations, I have notated “plain” and “decorated” versions for comparison. Update: The PDF and ABC files have been updated. The recordings will be up this week. Update 2: The recordings have now also been added. We also began looking at another single reel, My Love is on the Ocean, known in Ireland as The New Mown Meadows and played in another key there. This tune can be played as a single reel or as a double (i.e. with repeats for each part), although of course I can’t call it a double, but you know what I mean. This also exists in some old Scottish collections but I have never heard it played in Scotland. A common element to both tunes is the early roll on A, so I have included “plain” and “decorated” notations for this too. We’ll conclude working on this tune next time. The SMG whistlers concluded working on Corriechoillie’s Welcome to the Northern Meeting, revisited some previous tunes with an eye to the Stramash in a few weeks’ time. We also had a quick look at the Laridé de Portobello, a 2-part Breton tune with 7 variations. This entry was posted in classes, Community, FluteFling, Resources, Scots Music Group, The Flow and tagged flute, improver, Neil Gow, reel, reels, Scots, Scots Music Group, tin whistle. Bookmark the permalink.